We all know how much character and life can be brought to a room by plants, but not everyone has a green thumb. If you're often traveling, or own a curious kitty, a home full of plants and trees might bring you more stress than relaxation. The solution? Faux foliage. Gone are the days of papery plastic leaves and flowers featuring color combinations not found in nature. Today's fake plants look so close to the real thing that you'll find yourself poking your pothos to make sure it doesn't need water. Choosing the right fake plants for your home depends on your aesthetic. You might be looking for some traditional boxwood topiaries to frame your entryway, or a few petite succulents to adorn your bathroom vanity. 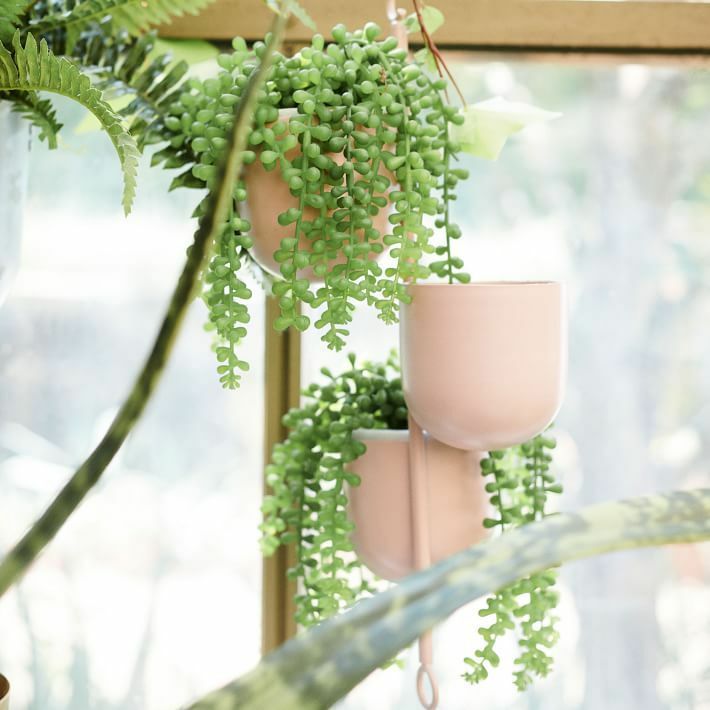 We've rounded up the best places to buy fake plants online, whether you're looking for a houseplant, indoor tree or cacti. Trees, succulents, snake plants and more—Target has a little bit of everything when it comes to faux plants. 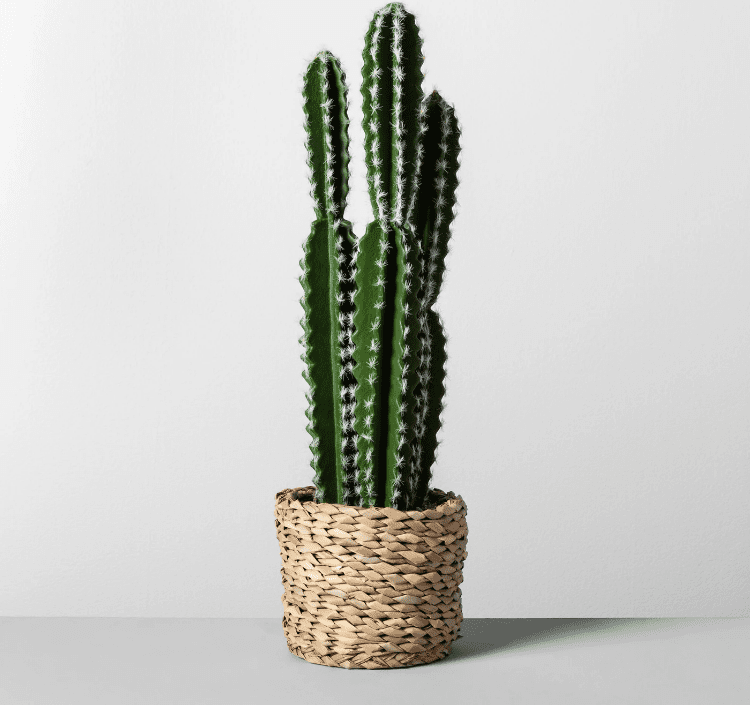 We love this 23" faux cactus that comes already seated in a stylish wicker basket, ready to be styled in your living room, bathroom or anywhere you want to add a little Southwest flair. Leave it to West Elm to convince us that a fake plant might actually look better than the real thing! The home decor and furniture store has a well-curated, life-like collection of faux plants, including these trailing succulents that look especially cool in hanging terra cotta pots. While at times they can be a bit pricey, you will find a huge selection of faux plants of all sizes and types available from Wayfair. For example, this set of tiny succulents looks great as a group, styled together on a coffee table, but we could also see them being the perfect addition to a desk area that needs some color or a bathroom vanity. A good spot to shop for topiaries and tree-like palms, One Kings Lane's offerings of faux plants are definitely on the pricier end of things. But a higher price point means better materials, attention to detail and large scale designs. So if you're looking to invest in a large life-like tree, like this huge bird of paradise, OKL has tons of amazing options. Plus, you only have to pay one time to enjoy an evergreen addition to your home, with no risk of accidentally killing it, even years down the line! Nearly Natural sells plants to a variety of other big box sites, but you can go directly to the source to shop for a huge variety of silk plants. But be warned that silk plants (as opposed to plastic) can show wear if they're attacked by pets or get bleached by the sun. If you've dreamed of adding a stylish Fiddle Leaf Fig tree to your home but dread the challenge of caring for it—look no further than World Market. They have a wonderfully realistic tree for under $130, as well as a nice collection of smaller faux plants. No surprise here, but if you're willing to put in the work searching and reading reviews, you can find a ton of good-looking faux plants on Amazon. One of our favorite finds is this set of two hanging faux ivy plants for just $15. We could see these making an excellent cover for industrial fencing out doors, or to make a tiny balcony feel more cozy. Ikea's collection of fake plants isn't exactly life-changing, but it's hard to argue with their prices. A sweet little plant like this baby's tears is just $5! Ikea's shipping prices can be hefty, so we recommend coupling your plant purchase with another home decor investment that will make the delivery fees worthwhile. You might not think of it, but Urban Outfitters is actually a great home decor resource that's not just for college students outfitting their dorms. They have a small but well-curated collection of faux plants that are ideal for the millennial aesthetic or anyone looking to add a boho touch to their home. And finally, we can't leave out Overstock! This site has a lot of... Everything, as you probably know. But if you know exactly what you're looking for, like a few faux boxwood topiaries to adorn your outdoor dining table or patio, you'll find affordable options... and probably a few more things you didn't even know you needed but now definitely want.